Authorized DeWALT Dealer + Full Factory Warranty!!! The DeWalt 12-inch Slide Compound Miter Saw has a powerful 15-ampere, 3,800-revolutions-per-minute motor with a large cutting capacity and extended durability. The miter system and the fence support allow you to make straight and accurate cuts every time. The oversized bevel scale makes it easy to perform granular, bevel-angle adjustments. 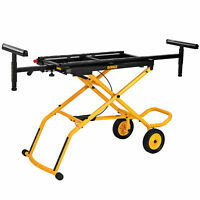 Weighing 51 pounds, the saw is compact for easy transportation and storage. Item exactly as described.. Lightning Fast shipping!! Thanks! Lighting fast shipping brand new still in the plastic!! Fantastic seller!! I am VERY impressed with this piece of machinery!!! I have been looking at miter saws for a long time now and finally decided to get one. This unit is the nicest piece of wood working equipment I own! 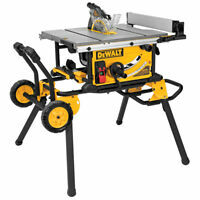 It's the same great quality from DeWalt and I got this saw for about half the price! It is user friendly and swivels to create multiple compound angles with ease. It comes with about a 5 foot long cord for easy electrical socket reach too, I have already used it to build a pair of folding multiple use saw horses and I love the fact that I can use one saw in my shop to make all of my compound angle cuts without having to remove the blade guard and reach way back into the machine like I do with my radial arm saw. I wish I had bought this unit a long time ago!!! Very good saw for the money. This saw is as good as the more expensive DWS780. It does not have the light and it doesn't cut as wide material as the 780, but by adding a sacrificial board under the material being cut does allow it to cut wider material. It has a lot of talent.